I rarely have good news lately, but today I have two encouraging stories to share. The first was originally posted at Answers In Genesis. We need more Christian scientists like Dr. Georgia Purdom to give their testimony and also demonstrate how science does NOT contradict the Bible and its historical accounts, but affirms it. The second story was written by Christina Wilkins, a biology major at Mid America Nazarene University. This past weekend I had the opportunity to speak at Dunbar Church of the Nazarene in Dunbar, West Virginia. This was a special privilege for me because I was raised in the Nazarene church and taught for six years as a biology professor at Mount Vernon Nazarene University. On Saturday I presented twice to the women of the church, sharing my testimony and the foundational importance of Genesis to biblical womanhood. On Sunday I gave presentations on the importance of Genesis to biblical authority and the eugenics movement, both historical and modern. The pastor of the church, Greg Hudson, taught on the Seven C’s in seven sermons before my arrival, so the congregation was well prepared and very receptive. Pastor Hudson shared with me that he heard Ken Ham speak at a chapel service at God’s Bible College (Cincinnati) back in 1994 (just as AiG was beginning). He said the service greatly impacted him and made him realize how important Genesis is to biblical authority. From my conversations with Pastor Hudson and the members of his congregation, I know that he has a great love for God and the truthfulness of His Word. He is gravely concerned—as am I—about the theological liberalism that is beginning to take hold in the Nazarene denomination. Both of us throughout the weekend challenged the congregation with examples of this liberalism as it concerns not only Genesis but also other areas such as homosexuality and the existence of a literal hell. (I encourage you to read Ken’s recent blog post about an article written by two professors at Nazarene universities). We pray that those we spoke to will become equipped and uphold God’s Word within the Nazarene denomination. This trip was also special for me because my daughter Elizabeth got to accompany me as my “assistant.” She unpacked DVDs, helped organize the resource tables, handed out materials, and more. I was very proud of her (in case you can’t tell), and I look forward to her coming to future events when possible. We also enjoyed eating several meals with and attending a minor league baseball game with Pastor Hudson and his wife Julie and daughter Hannah. Hannah and Elizabeth got to spend time together, especially when I was speaking, and I am grateful for the friendship they formed. This is an exciting week, as I’m really looking forward to the Answers for Women conference beginning Thursday at the Creation Museum. If you haven’t registered, don’t worry; you can still register at the door! Please be in prayer for this conference, that many women will be encouraged and equipped to defend God’s Word. Keep fighting the good fight of the faith! 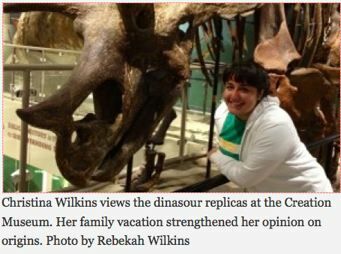 Last week, I wrote an April Fool’s article with an opinion that no one on campus would believe was truly mine: that I was an evolutionist. I am a biology major, so I’ve studied evolution. At my first biology class, I was hit hard with the fact that there is no clear consensus on this issue among Christians. I’ve come to realize that even though I don’t agree with theistic evolutionists about origins, there is still a lot that we do agree on. I have a special bond with biologists, who marvel at God’s creation. I can respect them as believers and as intelligent people. My April Fool’s article was a joke because it was written by me. The day after publication, my fellow biology majors told me how they laughed at my article. Strangers, however, didn’t think it was so funny. Last summer at the Creation Museum, my spirit was refreshed. I saw Biblical truth come to life in a way that doesn’t contradict what I’ve learned from science. I felt stretched as well as uplifted. In fact, some of my fake arguments were inspired by one room in the Creation Museum walk-through. One side of the room shows the modern family in church, and the pastor is preaching that Christians shouldn’t get caught up in the debate because the Bible wasn’t meant to be a science textbook. The foundation of Biblical truth is being undermined, resulting in a gospel stripped of power. If Genesis isn’t historical fact, how can we trust that the resurrection is a historical fact? The point is that what we believe about Genesis matters. Yesterday was Easter, when we celebrate that Christ’s death and resurrection redeemed us from our sin. That sin was made an inherent human trait when Adam and Eve sinned, ruining the world that God described as good. Romans 5:15 says, “For if the many died by the trespass of the one man, how much more did God’s grace and the gift that came by the grace of the one man, Jesus Christ, overflow to the many!” The sin and death that entrapped me before I knew Christ came from one man’s sin, and I was saved through one man’s sacrifice. In Romans 5:12, it is clear that death came into the world through the first sin. If it took billions of years of death for humans to evolve, and then have sinned, how could death be the result of that sin? In this view, God must have described the death, and associated suffering, as good. And what about the wages of sin? Sunday school taught us Romans 6:23. If the wages of sin isn’t death, where is the need for the gift? I can’t believe that the creation vs. evolution debate doesn’t matter. I’m going to run the risk of being long-winded to throw one last real opinion out there, and one that I first heard at the Creation Museum. When I read Genesis, I see that the first attack on God from the devil was an attack on God’s word. Genesis 3:1b says, “’Did God really say, ‘You must not eat from any tree in the garden’?’” He questioned something that should have been clear to Eve because God said it. Genesis is just as clear and more than just an elegant narrative. The following is excerpted from The Beginning of the World by Dr. Henry Morris, pp. 12-15. Morris had a Ph.D. in hydraulics and hydrology from the University of Minnesota. For thirteen years he was Professor of Hydraulic Engineering and Head of the Civil Engineering Department of Virginia Polytechnic Institute and University. He was a Fellow of the American Association for Advancement of Science and the author of the textbook Applied Hydraulics in Engineering. It is significant that present processes, which are the only kinds of processes which can be tested by the scientific method, are not in any way creative processes. That is, the basic laws of modern science, which describe these present processes, are laws of conservation and deterioration, not of creation and integration. These laws deal with the fundamental behavior of matter and energy, which actually include everything in the physical universe, and are known as the first and second laws of thermodynamics. Thermodynamics (from two Greek words meaning ‘heat power’) is the science dealing with the conversion of heat and other forms of energy into work. It is now known that everything in the universe is energy in some form, and everything that ‘happens’ is basically an energy conversion process. Thus, the first and second laws of thermodynamics could just as well be called the first and second laws of science. All processes in the universe, as far as known, have to obey these two laws. The first law of thermodynamics is also called the law of energy conservation. This law states that, although energy can be changed in form, it is not now being either created or destroyed Since all physical phenomena, including matter itself, are merely different forms of energy, this clearly implies that creation was an event of the past and is no longer going on. The second law of thermodynamics, stated in nontechnical form, says that all physical systems, if left to themselves, tend to become disorganized. Thus, machines wear out, processes run down, organisms get old and die. Any temporary increase in organization requires an input of energy from outside the system itself. This all proves, as well as ‘science’ is able to demonstrate anything, that evolution, which requires a continuing universal process of development and integration, is simply not true at the present time. This is why no one has seen evolution occurring. There is nothing whatsoever in science to prevent us from accepting the revealed fact that God created all things, calling them into existence ex nihilo … in a fully developed and functioning state right from the beginning. This fact is confirmed not only by Scripture but also by the two laws of thermodynamics. The second law states, in effect, that the universe must have had a beginning: otherwise, since it is now running down, it would already be dead. The first law, on the other hand, states in effect that the universe could not have created itself. It must have been created, therefore, by some adequate Cause beyond itself. ‘In the beginning God created the heaven and the earth’ is the most scientific statement that could possibly be made about the origin of the universe, based on the known laws of science. Note: SoulForce just recently visited Trevecca Nazarene University on March 11 and March 12, 2012, for an afternoon of discussion, fellowship and learning. It was open only to Trevecca faculty and students. No reports of the meetings are available at the moment. Olathe, Kansas: During a day and a half of meetings with a group of gay-rights activists traveling the country to battle discrimination on college campuses, MidAmerica Nazarene University (MNU) accomplished its goal of communicating the love of Christ to its visitors without approving of the lifestyle they have chosen. Soulforce, a national gay-rights organization, initiated a program last spring called Equality Ride in which young adults travel by bus to Christian campuses to confront administrators, faculty, and students with policies and practices that Soulforce considers to be discriminatory against gay, lesbian, bisexual, and transgender students. Soulforce Equality Ride was not invited to the campuses, but did give prior notice that they were coming. This year MNU and Northwest Nazarene University (NNU) are among the Christian universities targeted by the organization. The Ride is scheduled to visit NNU on April 13. Many targeted colleges ban the activists from campus, and in most cases, the Riders have been arrested for trespassing on campus property. Before arriving at MNU on March 15, the Riders were arrested at the University of Notre Dame and Wisconsin Lutheran University. In contrast, MidAmerica chose to welcome the activists, hosting them for a dinner with student leaders on Thursday night and six classroom presentations on Friday. At an exit meeting, several Equality Riders expressed their appreciation for the kindness and openness with which they had been received by members of the university. One Rider tearfully expressed her thanks. For some of the Riders, it was their first experience with Christians being willing to love and listen to them. MNU President Ed Robinson said the visit and the campus’ preparations actually strengthened MNU’s commitment to its policy on homosexuality. MNU wishes to express its gratitude for the prayers offered around the world by churches and constituents during the visit. Most of all, thanks be to God! The Board of General Superintendents recently issued a statement that essentially affirms a denominational position on the concept that while homosexual “orientation” is “amoral,” it is not the same as immoral homosexual behavior. That error in logic and biblical doctrine has been addressed sufficiently by many who see it as the unscriptural compromise that it is, so I will move on with this matter at hand while keeping in mind that position by the General Superintendents as contributing to this response. The important question about this incident is, “What is missing?” They expressed Christ’s “love.” What love? Was it the love of God who gave His only begotten Son that whosoever believeth in Him should not perish? That was not mentioned. Was there a call to repentance, to accept Christ as personal Savior? That was not mentioned in the article as well as there was no mention of prayer at all. The only response to all of that effort was someone’s tearfully telling a Nazarene host his or her appreciation for the non-condemning hosting. What a squandered opportunity to win that soul to Christ! He or she went away thinking that Nazarenes support them in their sin and the Nazarene went away empty handed. If that encounter amounted to no more than being pals and no personal evangelism, I would say that the verse applies to tragic proportions.